It is a real delight to join you at the sixth Cambridge University International Real Estate Finance and Investment Conference. First, what does the BRI mean to the world? Second, what is UK’s role in the building of the BRI? Third, how to seize the opportunities offered by the BRI? Let me begin with the first question. Five years ago, President Xi Jinping proposed the BRI. This Initiative is aimed at enhancing connectivity between countries and regions of the world so as to achieve inter-connected development and open new space for world economic growth. First, the BRI carries forward the spirit of open cooperation. The world is undergoing profound changes unseen in a century. Development and cooperation remain the theme of our times. However, anti-globalisation, unilateralism, protectionism and populism are on the rise. Under these circumstances, the BRI advocates openness. It is not drawing a line between different ideologies. Neither is it a “zero-sum” or geopolitical game. The BRI voices strong support for integrated development of all economies, with a view to building a community with a shared future for mankind. As of today, China has signed cooperation agreements on the BRI with more than 140 international organisations and countries from Asia, Africa, Europe, Latin American, the Caribbean and South Pacific. In the past five years, the BRI and its fundamental ideas of “extensive consultation, joint contribution and shared benefits” have been incorporated into the outcome documents of international mechanisms, such as the UN General Assembly, the UN Security Council, the G20 and APEC. Since the beginning of this year, new consensus on the BRI has been reached at the Ministerial Meeting of the China and Community of Latin America and Caribbean States (CELAC), at the Summit of Shanghai Cooperation Organization in Qingdao, China and at the Beijing Summit of the Forum on China-Africa Cooperation. These figures and examples are strong proof that the BRI is an open and inclusive platform dedicated to international cooperation. It is increasingly gaining positive response and enthusiastic participation. Let me give you more numbers. Early this month, the China International Import Expo was held in Shanghai. This first-ever Expo dedicated to import saw the participation of 172 countries, regional economies and international organizations. It has attracted more than 3,600 companies and over 400,000 buyers, and $57.83 billion worth of deals of intended purchases were signed. More than 1,000 companies from 58 countries along the BRI routes were among those present at the Expo. They accounted for close to one third of all the participating companies. This Expo demonstrates China’s sincerity and resolve to embrace the world with open arms. It also reaffirms the BRI spirit of open cooperation, which reflects the trend of our times. Second, the BRI has borne abundant fruits of win-win cooperation. Countries along the routes of the BRI want development and prosperity. The BRI meets that aspiration and has delivered tangible benefits to the people of these countries. In the past five years, the BRI has developed from a concept to projects and from a plan to actions. China has invested more than $86 billion in countries along the routes, including more than $28 billion in 82 economic and trade cooperation zones that we helped establish along the routes. These zones have hosted 6,000 projects, created more than 240,000 jobs and contributed billions of dollars in tax to the local community. More than 10,300 China Railway Express trains have travelled between China and 43 cities in 15 European countries. Trade in goods between China and countries along the routes has exceeded $5 trillion. China has signed or upgraded five free trade agreements with 13 countries and is now the largest trading partner of 25 countries along the routes. In the coming five years, China plans to import $2 trillion of goods from and invest $150 billion in these countries. 81 educational institutions and projects have been launched by China in countries along the routes. More than 270 million RMB yuan was offered by the Silk Road Scholarship in the first half of this year. 35 cultural centres have been set up. The Silk Road International Museum Alliance, the Network of Silk Road Arts Festivals, the Silk Road International Library Alliance and the Silk Road International Alliance of Art Museums and Galleries have been established. The Silk Road NGO Cooperation Network has been expanded. It now has members from 61 countries and regions. Through these links, the BRI is strengthening the bond between the people of China and countries along the routes, and delivering real benefits to them. Third, the BRI leads the trend of our times in innovation-driven development. A new wave of transformation is affecting many sectors around the world. Progress in frontier technologies, such as information, bio-science, intelligent manufacturing and green energy, has been rapid. New materials, new technologies and new modes of business keep emerging. And the process of technological upgrading is accelerating. and promotes the development of big data, cloud computing and smart cities. At the same time, the BRI champions green, low-carbon and sustainable development and way of life. It is aimed at improving the eco-system, and achieving the 2030 Agenda for Sustainable Development through enhanced cooperation on eco-conservation and environmental protection. and provide strong impetus for countries to explore new driving forces and development paths. According to a survey a few months ago, 63% of the central banks from more than 30 countries and regions regard the BRI as “one of the most important initiatives of the past decade” and “a once-in-a-generation opportunity”, and 92% expect the BRI to bolster their domestic growth during the next five years. This survey fully demonstrates the high expectation for the future of the BRI. Now the BRI is standing at a new starting point and aiming for new progress. In the first half of next year, China will host the second Belt and Road Forum for International Cooperation (BRF) in Beijing. It will be a good opportunity to draw the participating parties in renewed, concerted effort to make greater progress in building the BRI and to deliver more benefits to our people. China and the UK are both big countries and great civilizations with global influence. In the new era, our joint effort in building the BRI enjoys enormous potential and promising prospects. The past five years have seen such effort becoming a major highlight in China-UK overall cooperation. First, the UK can be a strong supporter for the policies and ideas of BRI. The UK is known for its pioneering spirit. It was the first major Western country to apply to join the Asian Infrastructure Investment Bank (AIIB), and second only to China to contribute to the AIIB special fund. The British Government showed its vision by making the UK a “natural partner” of China and deepening cooperation with China on the BRI. Chancellor Hammond attended the first BRF as Special Envoy of Prime Minister May. At that forum, the UK became the first Western country to sign the Guiding Principles on Financing the Development of the Belt and Road. This was a positive contribution to the success of the first BRF. Early this year, Prime Minister May paid a successful visit to China. During the visit, the leaders of our two countries agreed to expand China-UK cooperation on the BRI. The British Government has appointed a BRI Special Envoy. An Expert Board was set up at the same time to enhance policy coordination and promote the development of the BRI. Second, the UK can set a good example of how to achieve early harvests. As the UK deepens its understanding of the BRI, cooperation between our two countries is producing an increasing number of early harvests. The main structure of the Hinkley Point C nuclear power plant, a flagship project of China-UK cooperation, is being built, and the generic design assessment on Hualong One nuclear technology has entered the third phase. The ABP Royal Albert Dock, with £1.7 billion of investment from the Chinese company ABP, has broken ground. The China-UK Innovation Industrial Park in Qingdao, the first sub-national cooperation park between our two countries, is making good progress. China Railway Express ran its first freight train between China’s Yiwu and London, offering a new, on-land option for the movement of goods between China and Britain. This has extended the Belt and Road to the western end of Europe. Moreover, British companies and financial institutions, such as HSBC, Standard Chartered, BP and KPMG, have engaged in fruitful cooperation with China in third markets along the BRI routes, providing financing expertise and services. 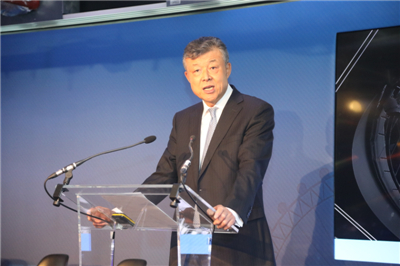 Standard Chartered announced that it would provide $20 billion in financing support to BRI projects before 2020. Third, the UK can be a pioneer in exploring deeper cooperation on the BRI. The UK has unique strength in financial services, think-tank and creative industry. In recent years, people from all walks of life have come forward with numerous ideas on how to leverage these strengths to engage more deeply in the BRI development. Last September, the All-Party Parliamentary Group for the BRI and China-Pakistan Economic Corridor was established. Reports on the BRI have been published by institutions such as the China-Britain Business Council. And seminars on BRI cooperation have been held by think-tanks such as the Royal Institute of International Affairs. All in all, the UK has already engaged in deep cooperation on the BRI. At the end of last year, the UK pledged £25 billion in support of key BRI projects. This would make London an important market of BRI project financing. 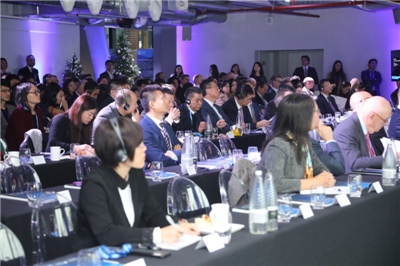 Earlier this month, The Duke of York and the Secretary of State for International Trade Liam Fox led more than 50 British companies to the first-ever China International Import Expo. Over £2 billion of business deals were signed at the Expo, covering areas such as health care, education, culture, and creative industries. This has been a strong boost to trade connectivity between our two countries. For thousands of years, an important indicator for a happy life is “a safe place to live and a secure job”. The rapid urbanisation process in developing countries along the BRI routes promises new opportunities to international real estate finance and investment. How to seize these opportunities? I wish to share with you four suggestions. My first suggestion is to adhere to open cooperation. Openness and connectivity represent the trend of our times. Open cooperation can provide us with more opportunities as well as more space for development. Chinese businesses are optimistic about the future of the British real estate market after Brexit. According to the UK Commercial Property Investment Review 2017 published by CoStar, a leading provider of commercial real estate information services, Chinese investments in the British commercial property market in 2017 (including those from Hong Kong) totaled £8.246 billion, topping all foreign investment in the UK. I am glad that this year the purchase of the new premises of the Chinese Embassy in London has contributed to this figure. China and the UK are both staunch supporters for free trade and an open world economy. There is every reason that we should uphold openness and inclusiveness, and stand against protectionism. Through open cooperation, we could expand our common interests. My second suggestion is to pool our comparative strengths. In infrastructure development, China has capital and technology, while the UK can provide financial and other professional services, such as project financing, insurance and risk management. Our comparative strengths have created opportunities for us to work together to achieve win-win results. By combining the UK’s knowledge, expertise and creative ideas with China’s technology and commercialisation capability, our two countries can achieve multiplying effect in our cooperation on international real estate development. My third suggestion is to strengthen the sense of brand in the interest of long term development. Product quality is the lifeline of a company. This is particularly true for real estate finance and investment. The BRI stresses the importance of rules, respects universally-accepted laws and regulations, and advocates high-level, high-standard, green and sustainable cooperation. care for people’s well-being and fulfill corporate social responsibilities, rather than focusing solely on profits and selfish interests. My fourth suggestion is to have an innovative global vision. Enhanced connectivity in infrastructure and trade along the BRI routes will unleash more and more opportunities for trade and economic cooperation zones, logistics and real estate, and urban development. The BRI serves as a platform for China and the UK to work together to explore a third market. Our two countries should seize this opportunity to create new models and find new ways of tri-party and multi-party cooperation on real estate finance and investment. If we can join hands and be innovative, we can share the opportunities and tap our potential for growth. 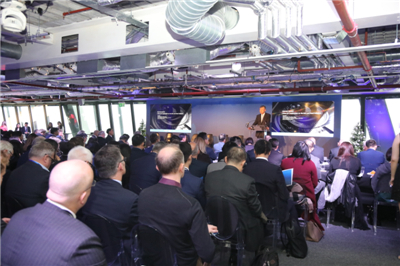 The venue of today’s Conference, the “Cheesegrater”, is not only a famous landmark in the City of London but also an epitome of the flourishing China-UK cooperation on real estate investment. Our cooperation on the BRI and in other areas promises broad and bright prospects. I hope that people from all walks of life in both our two countries will join hands and make tireless efforts to promote China-UK cooperation on the BRI. Together we can create an ever-brighter future for the China-UK “Golden Era”!